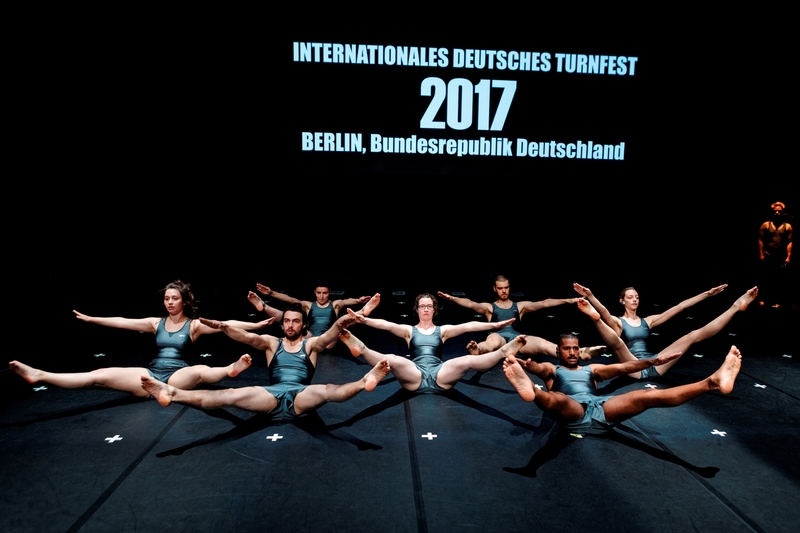 SECOND ESSAY ON GYMNASTICS is based on the interconnectedness of two histories: that of Germany as an imagined community and that of ‚Turnen‘ (German gymnastics) as a physical practice – from its roots in 1811 as military exercise against the French occupation to the German Gymnastics Festival 2017 under the heading of „How colorful is this!“. 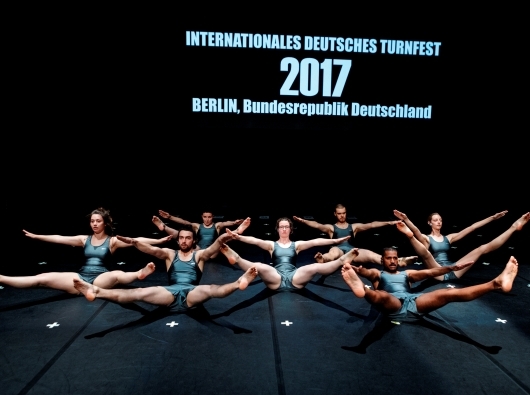 In SECOND ESSAY ON GYMNASTICS, eight performers use the choreographic vocabulary of the ‚Turner‘ movement and its performance in synchronized gymnastics shows as a point of departure for an examination of the formation of german bodies and thus try to tell an alternative german history. HAUPTAKTION is an association for artistic research formed around the producer and dramaturg Hannah Saar, the cultural anthropologist Julian Warner and the theatre maker Oliver Zahn. 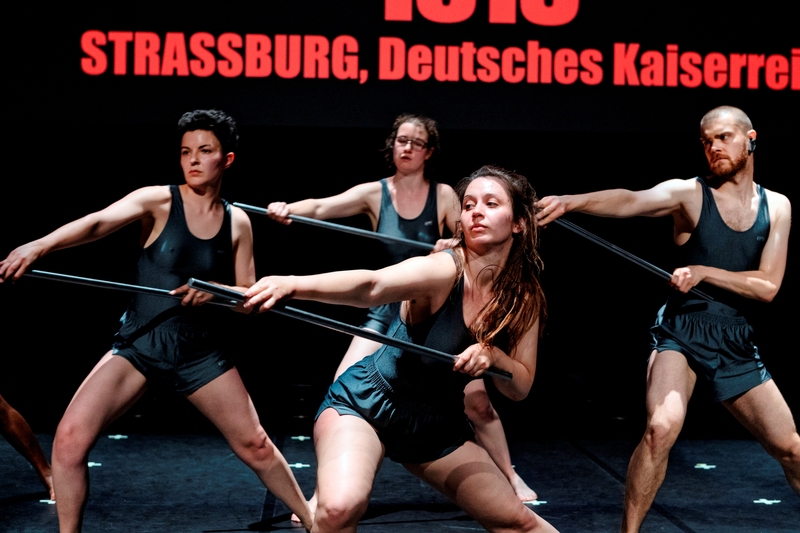 HAUPTAKTION studies theatrical practices using ethnography, archive-based-research and embodiment and has an output of texts, theatre, lectures. 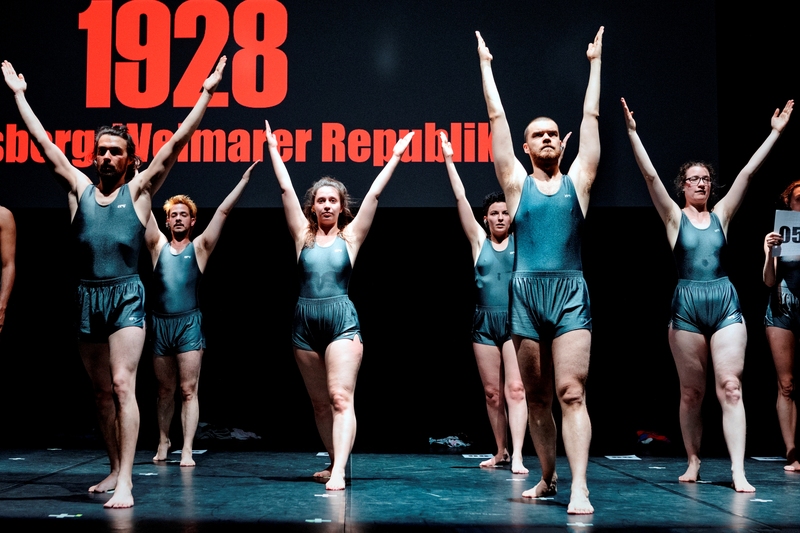 Theatre works include SITUATION WITH OUTSTRETCHED ARM (on the cultural history of the „Nazi salute“-gesture) and SITUATION WITH DOPPELGÄNGER (on minstrel dance, cultural appropriation and imitation). These pieces are theatrical essays, situated between choreography and historical study. They are being presented internationally. The name HAUPTAKTION is taken from the practice of German-speaking travelling theatres. RODEO Festival: Oct. 14, 2018 - 3 p.m.
A production by HAUPTAKTION. 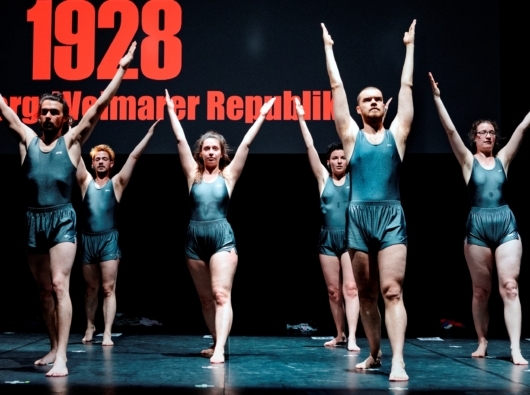 Co-produced by Münchner Kammerspiele, SPIELART Munich, HAU Hebbel am Ufer Berlin, Schwankhalle Bremen and Theater Rampe Stuttgart. In Kooperation with Pavillion Hanover. 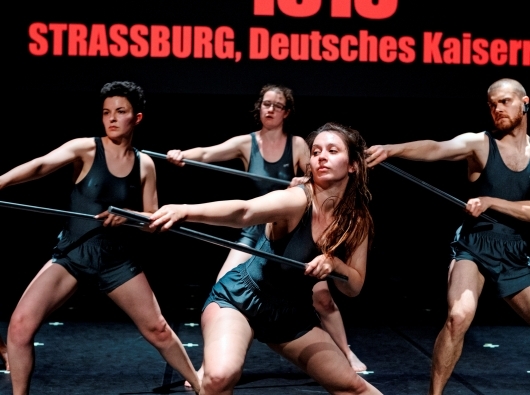 Funded by Landeshauptstadt München, Bezirk Oberbayern, Lotto-Sport-Stiftung Niedersachsen and TANZFONDS ERBE – an initiative by the German Federal Cultural Foundation.